Install a no-light louver in a wall or door opposite the exhaust fan to adequately draw fresh air into the room. Some situations may require the construction of a wooden frame to fit between studding, etc. as an anchor for the fan housing. Fan can be mounted on a wall or a ceiling, just ensure the air flow is not in the technicians face. Fits into a 12" x 12" opening. 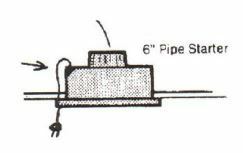 All units that have 6" pipe starters should add to the starter a 6" diameter elbow and approximately 12 inches of 6" diameter pipe. This can prevent or at least reduce the possibility of outside air pressure backing up into the fan on windy days. Note: This applies to units that are exhausting to the outside of the building. Buy elbows and pipe at a local hardware or heating supply store. Remove one louvered frame insert to decrease air resistance and increase the flow of air into the exhaust area. Note: A good ventilation system will avoid drawing the fumes over the technician's face. Blow air into the darkroom from the dry side of the darkroom and have the exhaust draw the air above the wet side, over the chemical bath areas, but not so high as to have the air travel over the technician's face. Place exhaust fan as close as possible to the chemical area of the wet side, so fumes are drawn out immediately. Connect cord inside the darkroom by routing the cord from back to the front. Cut a slot in the side of the frame large enough to accommodate the cord.